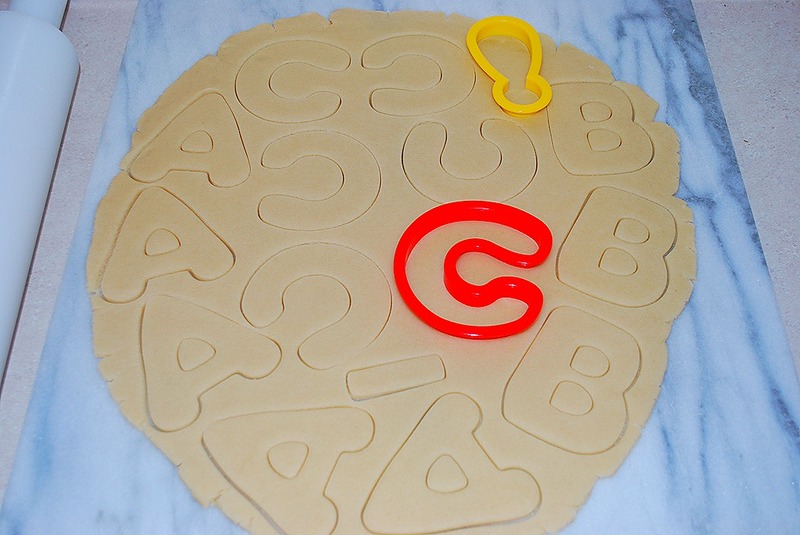 ABC, easy as 123…blah blah blah, ABC baby you and me! No idea what the middle of that line is, but I knew it has letters in it. 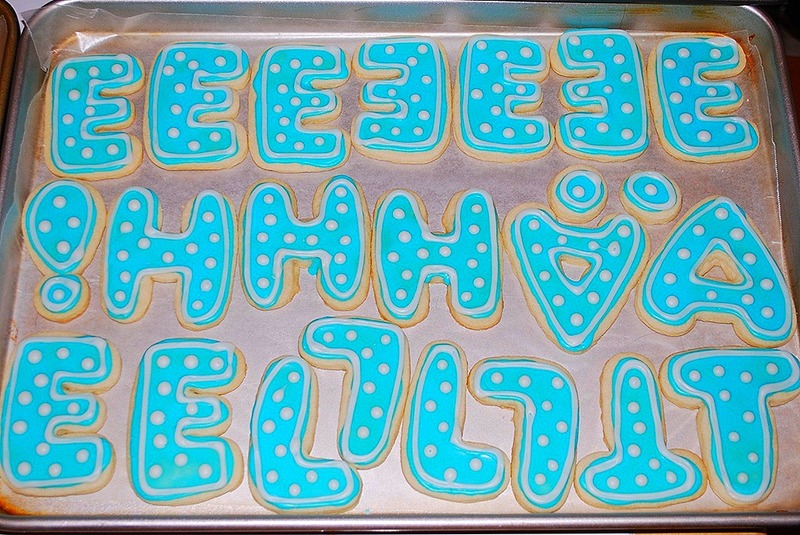 I made some letter cookies for my school. 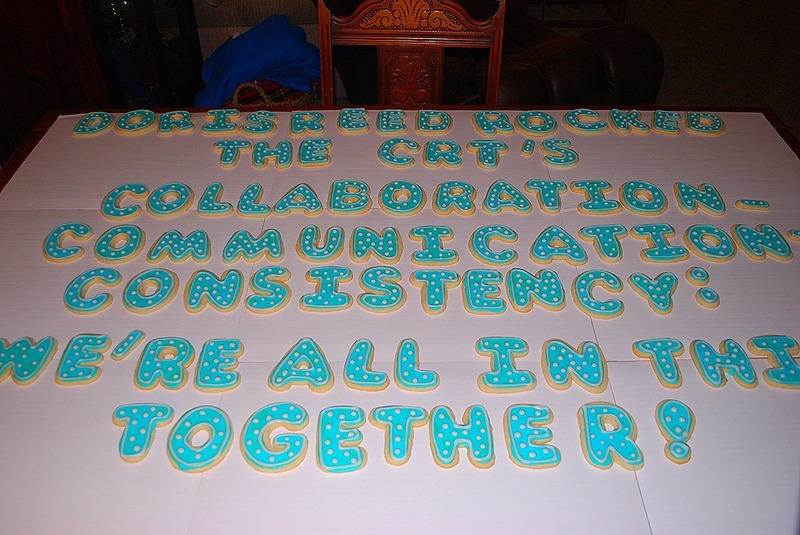 My AP asked me to bake a ton of cookies and spell out some phrases for a surprise luncheon. We had finished with testing—which is an awful, long, and stressful time in a school—and she wanted to surprise the staff with a lunch and cookies in the lounge. For the cookies, I used my mama’s butter cookies. As tempted as I am to try a new recipe, I loooooove this one. One of these days, I will get around to a new one, but not today. The cookies always come out perfectly buttery and browned. They hold up well to frosting and have the perfect cookie crunch. Since these are a butter cookie, the main ingredient is buttah!! 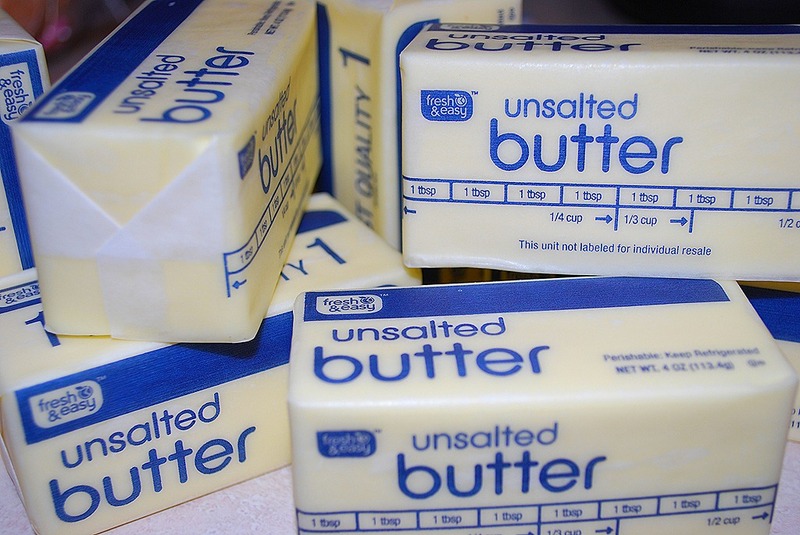 Lots and lots of butter goes in these, but it is totally worth it. I usually divide the dough up into a couple of dough balls. It is easier to work with smaller amounts. 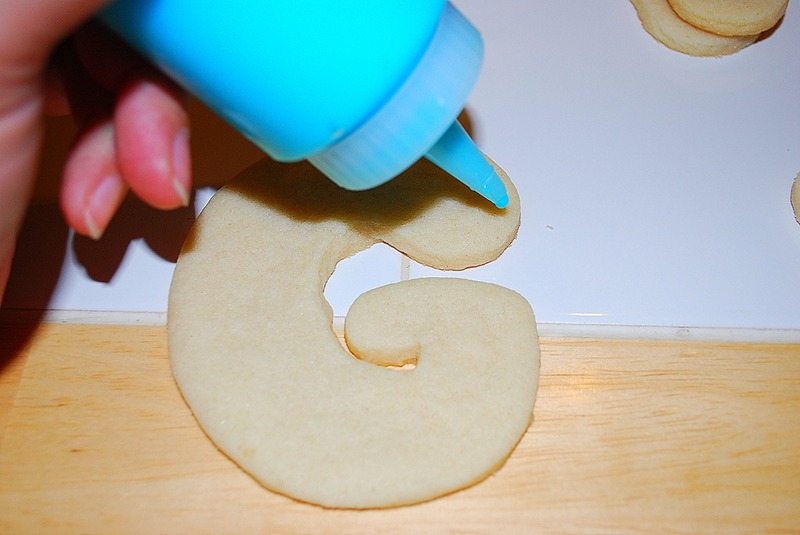 I roll the dough out and used the alphabet cutters to make all of the letters. I got an awesome new 20 inch rolling pin and marble board for Christmas that makes rolling things out ever more fun! 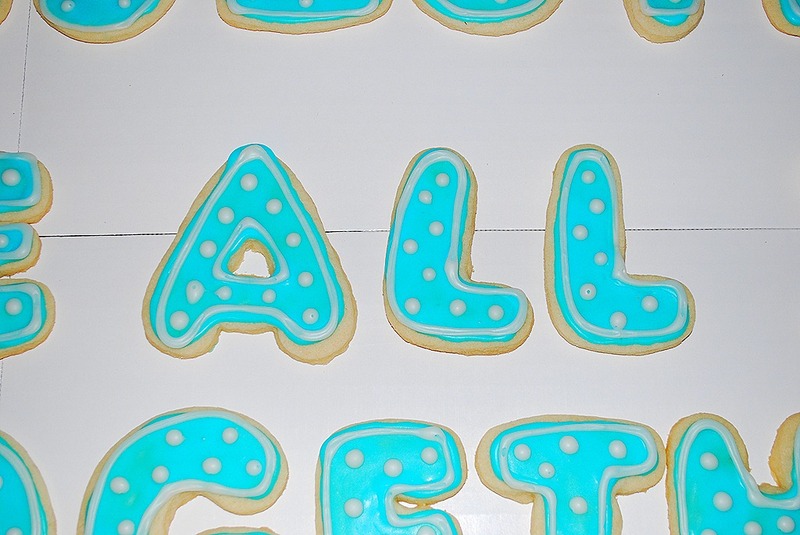 The part that was new for these cookies was the frosting. I usually use a buttercream type, but wanted these to dry hard. 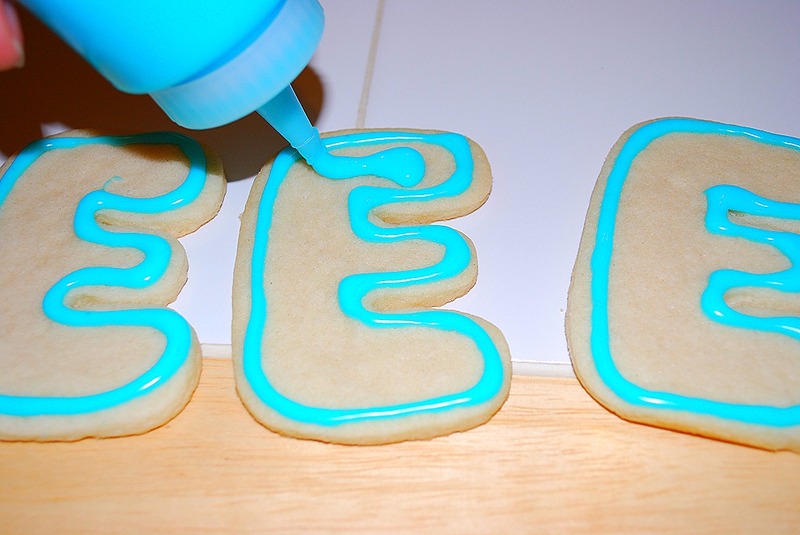 I have only tried royal icing once and was not a fan. I will definitely give it a go again, but wanted something a little different for these. I found an icing that would dried hard like royal, but taste like buttercream. Super easy and even better tasting. I am itching to make some more cookies and use it again. 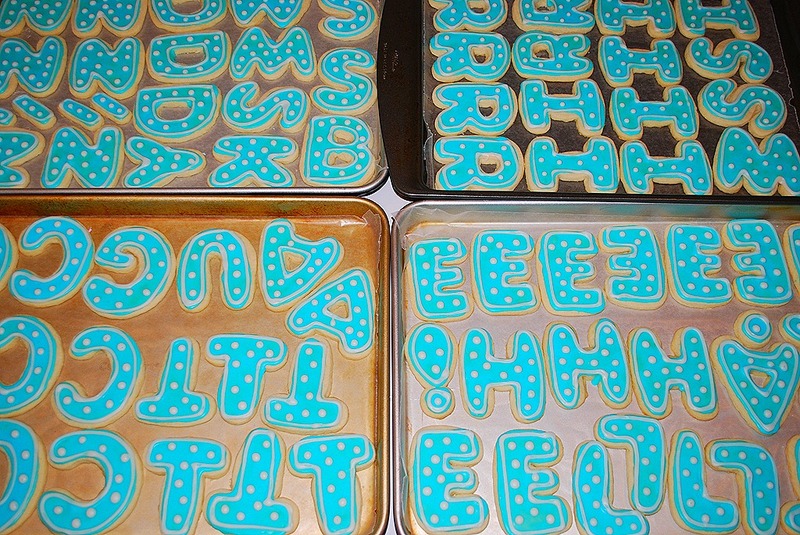 Once the cookies were cooled, I started outlining them with the blue frosting. I had tinted the first batch blue so I used that for the outline and filler. I let the outlines dry a little and then filled them in. I used a small squeeze bottle for both. To fill in, I used a small paintbrush that I use for baking. I let the blue dry overnight and then piped a white border around the edge and dots in the middle. I knew I wanted an outline of white, but the dots really made them pop. They dried hard to the touch but didn’t have a crunch when you took a bite. The frosting tasted perfectly sweet and easy to pipe. I will definitely use it again. Enjoy!! Mix everything together at a low speed until it is fully blended together. 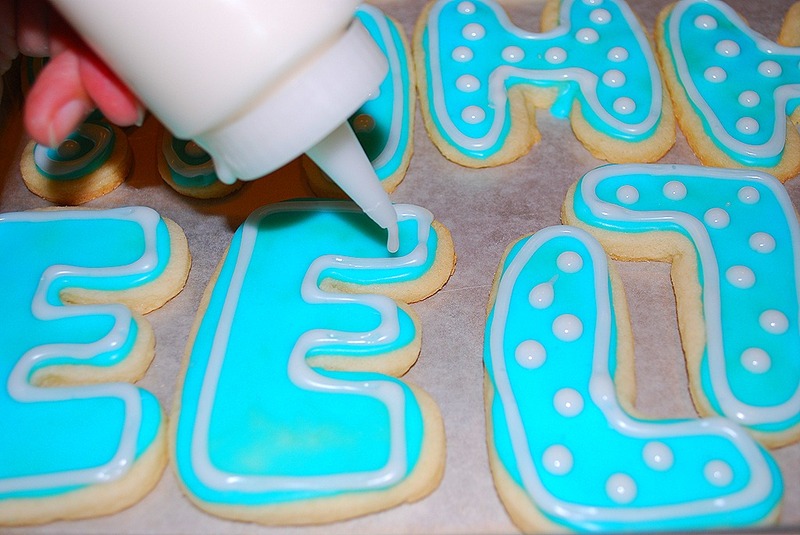 Don’t whip, as it will create bubble in the finished icing. Taste and add more of the emulsion as needed. This icing would take very well to other flavors like orange, lemon, or even mint. This can be refrigerated for about a week, but make sure it is at room temperature to frost the cookies.